The College provides resources and support for foundation doctors aspiring to a career in the physicianly specialties. The College runs a highly successful education programme, including online training modules and symposia, web-streamed live to a number of sites around the world. Find our more about these in our Events & CPD section and Events Calendar. The route to a career as a physician can be found in our specialty training guide. This outlines how training at each level is structured and delivered. You will also find competition ratios for selection at each step and links to the Joint Royal College of Physicians Training Board (JRCPTB), who develop and quality assure the training curricula. It's not too early to start thinking about a sub specialty. Visit our Medical Careers Resource for personal perspectives from consultants and specialty trainees on their career choices. 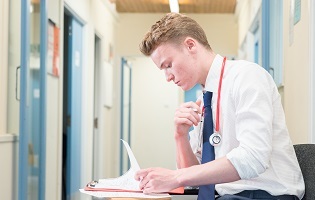 Foundation doctors have the opportunity to begin the MRCP(UK) exam process with many sitting Part 1 and occasionally Part 2 during this period. For more information on exam format, exam dates and advice on optimum times to sit, visit the Exam Section. Our Trainees and Members’ Committee is a group of elected representatives at all stages of training, from medical students to SAS doctors. Find out more about what they do.